Well, here we were with a day with no plans. Nothing we had to do but pack before we left the next day. We had a whole day in Sydney, one of the world’s great cities, to do whatever we wanted. So what would we do? What could we do? Eat and drink more stuff, naturally. The brother dropped me off at the Bourke Street Bakery to pick up some tasty breakfast. I walked home enjoying the sunshine (actual sunshine!) and woke up Nellie. We decided to do a little shopping (Nellie bought a new bag) and then hit up the one last beer place on our list: the King Street Brewhouse. 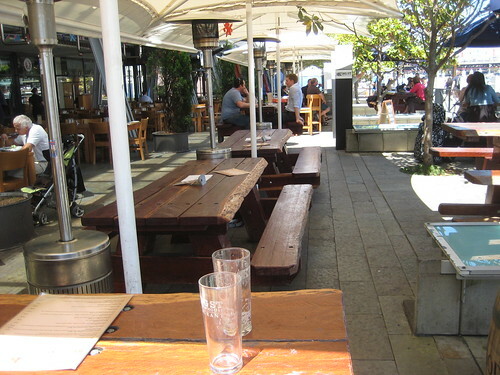 We enjoyed a few pints on a beautiful sunny afternoon by the water…which, I think, is how all last days in Sydney should be spent. I did have to fight off a few seagulls (and one managed to nick a fry even so) to protect our lunch…our last wildlife encounter. We stopped for one more pint at the Redoak, then jumped a train home and got our bags packed. We enjoyed our last afternoon and evening at home with the brother, eating a nice meal in the back yard, drinking wine from the Margaret River, chasing away feline interlopers, looking up at the stars and listening to something rather substantial creep stealthily along the fence.